Little big farm is the physical manifestation of our biggest dreams. Little Big Farm is a one acre market farm cultivating leased land in Olympia, Washington. To maximize the small amount of space available to us, we farm without a four-wheel tractor and keep our production system scaled to the abilities of the two of us, the farmers. We grow and direct market a diverse array of fresh mixed vegetables and specialize in our much-loved salad mix, bunched greens, fresh roots, and greenhouse crops. We offer this bounty through the Olympia Farmer's Market, and West Seattle and Queen Anne Farmers Markets in Seattle, as well as at the Olympia Food Co-op, and local restaurants. The littleness of Little Big is held close to us. By farming on such a small-scale, and utilizing appropriate-scale tools and technologies, our farm is able to produce exceptionally high yields and profitability per acre with an accountability that ensures quality. We truly believe in the small-scale, organic farm. While we are not yet certified organic, we follow these practices with great intention, and cultivate with ecologically informed principles in mind and at hand. At the forefront of our efforts is building and supporting soil health and ecological diversity through no-till practices. We test our soil annually and only apply amendments approved by the Organic Materials Review Institute (OMRI), as well as high quality compost. We never use any chemicals for weed and pest management. We take great care to build soil health and tilth through the use of hand and shallow cultivating tools, utilizing the power harrow on our BCS walking tractor, the hand-powered Tilther from Johnny's Seeds, aerating broadforks, and other innovative hand tools. Supporting the resilience that stems from this biological diversity grounds us in our place as farmers and gives perspective to our role in these natural systems. Little big farm is owned and operated by maya wood and phelan pagano. 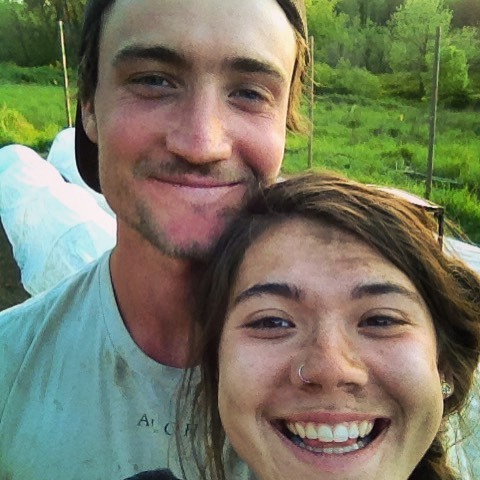 Maya and Phelan graduated together from the Evergreen State College in June 2016 with emphases in Sustainable Agriculture and have worked together on small-scale diversified farms in both Hawai’i and Washington. We were born and raised in Olympia, the place we call home, and are humbled to be able to grow for and with our community. Most days you'll see Maya at market, but consider yourself lucky if you happen to catch Phelan bagging salad mix or fussing with the radishes alongside her. One of Phelan's favorite activities is talking about hoophouses and high tunnels, so you'll be fast friends if you casually engage him in such a conversation. While Maya spends most of her time harvesting for and selling at markets, she cherishes most her time spent seeding. It must be something about the forced meditation that inevitably comes when you sow thousands of seeds in one go. Spending most of his daylight hours cultivating with his BCS power harrow and Tilther, Phelan finds solace in the distant hum of his two-wheel tractor and drill-powered tools. If you see him wearing headphones then he is most definitely either listening to the Farmer to Farmer podcast or roots reggae. Naturally, they both enjoy long walks on the beach at sunset. Or better yet, paddle ball on the beach at sunset.